Hey ladies! It's already late in the day, but I just couldn't help joining in the party for this month's Paint All The Nails linkup. I had something a little more elaborate planned originally for the animal print theme, but I just haven't had enough time to make it happen. I recently swatched the new Celestial Cosmetics Pun-tastic Collection (review post coming soon!) and each polish has an animal pun name. I couldn't pass up the chance to use them in my animal print nail art! Hey everyone! Today I have another partial collection review to share with you, four of the eight piece Native War Paints Labyrinth Collection. If you know me well you know I am a huge David Bowie fan. Naturally it would follow that I am a little obsessed with the movie "Labyrinth". Yesterday was the 30th anniversary of the movie's release and this collection was created in commemoration. 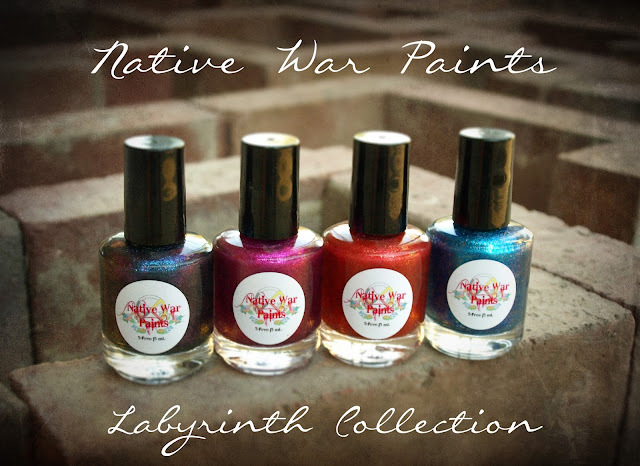 As soon as I saw teasers from Native War Paints of this collection, I knew I would be all over it! Hey ladies! I am trying super hard to get caught up on my posts! I've really been slacking the last couple of weeks and I have so many beautiful polishes to share. 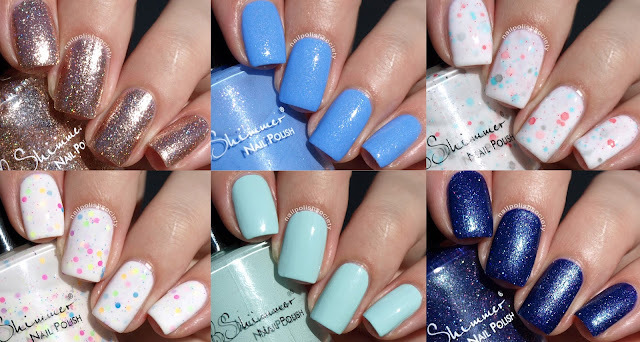 Today's post is five of the polishes from the Glam Polish Forever After Collection. This collection is an "Adventure through an Enchanted Kingdom with our twelve bright and sparkly shades inspired by the Magic of Fairytales." Here we are with another week of the ABC Challenge! Who's excited? I am! I still feel as sleep deprived as I did last week, so I haven't accomplished much, but at least I got this done! Hello dolls! You may remember my negative space rainbow feathers from last week where I showed off the watermarbling power of these bright pastels? 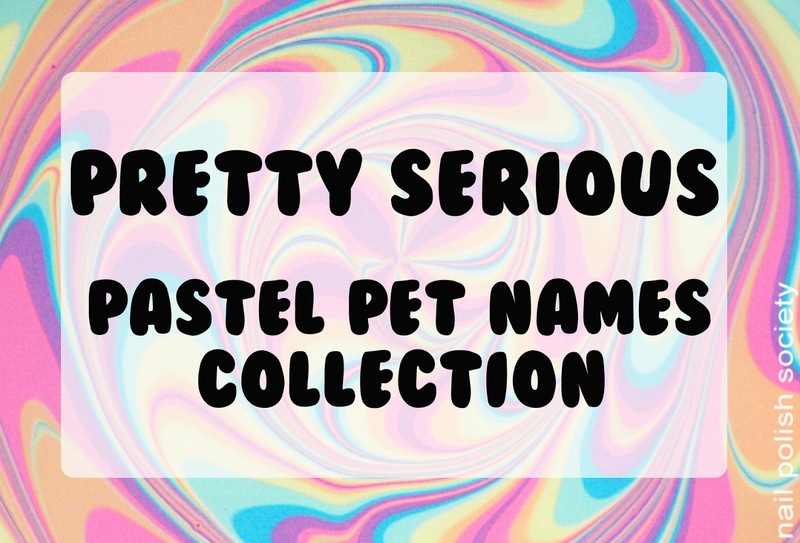 Well as promised I have swatches of the Pretty Serious Cosmetics Pastel Pet Names Collection to share today. This collection is part of "The Well Meaning But Ultimately Quite Awkward Pet Names" series. Don't you just love that? A pretty epic title if you ask me. Hello lovelies! 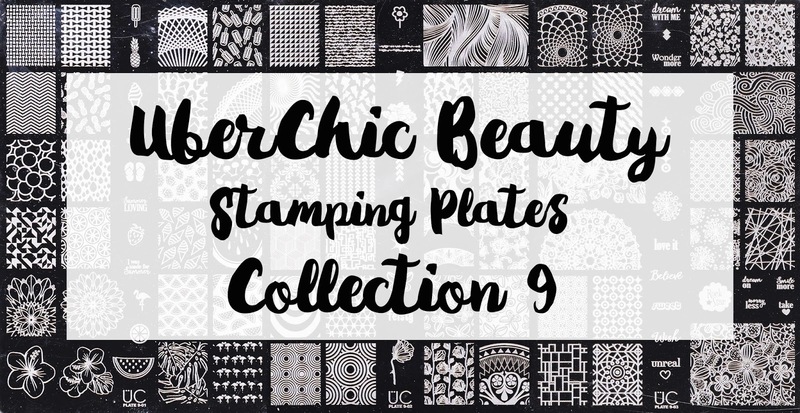 Today's post is a review of the UberChic Beauty Collection 9 stamping plates. While they're mostly a pretty random variety of images typical of the UberChic collections, the first plate does have a strong summer theme to it. I have some nail art using those images in the works, but for today's review I've gone with a more wear-any-day kind of feel. Let's look, shall we? Hello my nail polish people! Today's post is a long time coming. I have swatches of the twelve piece China Glaze Lite Brites Summer 2016 Collection to show you. I don't think I've ever done a post this big before, so it took me a while to complete. But boy, have I been dying to share these! If you haven't fallen in love with this collection yet, I will try to convince you now. I almost never buy entire collections from any brand. When I saw Smacker Lacquer's photos of the Lite Brites I was so impressed that I just went for it. No regrets, they are all as fabulous as I had hoped for. There's not a single one I don't like, and plenty that I love. Hey everyone! Today I have for you a review of a new brand, Nicole Diary. You may have noticed that I recently did a nail art mani using one of their decals (here). I stuck with the one accent nail again, but this look has a bright tropical vibe. Happy Monday everyone! Last week I ordered some of the new KBShimmer Summer 2016 Collection polishes, received them on the weekend, and swatched them right out of the box! I couldn't wait! Of the six polishes I received, five of these are from their new Summer 2016 release, and one is a Facebook group exclusive. Every season KBShimmer comes out with an amazing collection with a wide variety of formulas and finishes that compliment each other so well. From the twelve released it was hard to narrow it down to these few, but I'm so happy with what I chose! Hello everyone! How's your weekend shaping up so far? For today's post I have reviewed some What's Up Nails products, specifically their nail vinyl stencils and stickers. I had previously only tried their X-pattern stencil design (here and a modified version here), which I loved. So when the offer was extended to try some more designs for review I was all over that. I've done two different looks in this post. Read on to check them out! Hello ladies! It's Friday and you know what that means over hear at Nail Polish Society, ABC Challenge day! I have been pretty busy lately and have had no chance to get ahead of things. It's been a little stressful to be honest. I didn't have a ton of ideas for today's "E" prompt. So when my sister suggested doing something "Easy", I jumped at the chance. Hello everyone! Ready for some more neons?! I sure hope you are because am just a little obsessed with them this summer. 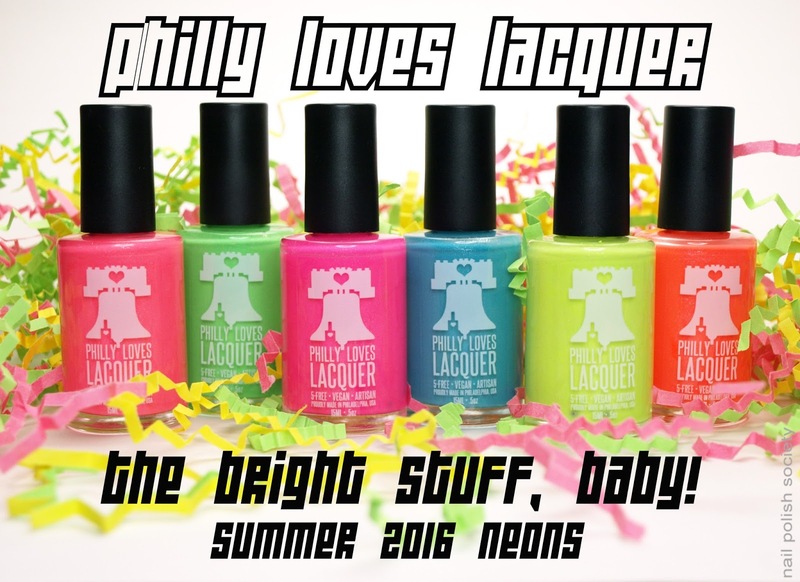 Today I have Philly Loves Lacquer's The Bright Stuff, Baby! collection, inspired by 80's and 90's boy bands. And guess what.. I even named one of the polishes! Read on to find out which one..